The act takes you into the universe of an unusual creature, juggling and manipulating five balls. She seems to have four hands and twenty fingers… or four feet and twenty toes? 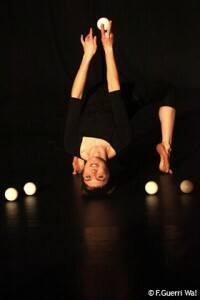 A very unique juggling performance that triggers the audience’s imagination and visual perception. 2 balls 2 feet and thousands of possibilities: surprises, laughters and for sure some unwritten moments….